Abstract This chapter lays the foundation for the work presented in latter chapters. The potential of 60 GHz frequency bands for high data rate wireless transfer is discussed and promising applications are enlisted. 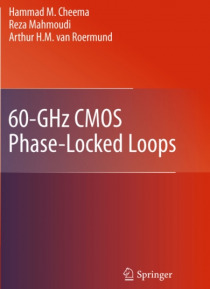 Furthermore, the challenges related to 60 GHz IC design are presented and the chapter concludes with an outline of the book. Keywords Wireless communication 60 GHz Millimeter wave inte… grated circuit design Phase-locked loop CMOS Communication technology has revolutionized our way of living over the last century. Since Marconi's transatlantic wireless experiment in 1901, there has been tremendous growth in wireless communication evolving from spark-gap telegraphy to today's mobile phones equipped with Internet access and multimedia capabilities. The omnipresence of wireless communication can be observed in widespread use of cellular telephony, short-range communication through wireless local area networks and personal area networks, wireless sensors and many others. The frequency spectrum from 1 to 6 GHz accommodates the vast majority of current wireless standards and applications. Coupled with the availability of low cost radio frequency (RF) components and mature integrated circuit (IC) techn- ogies, rapid expansion and implementation of these systems is witnessed. The downside of this expansion is the resulting scarcity of available bandwidth and allowable transmit powers. In addition, stringent limitations on spectrum and energy emissions have been enforced by regulatory bodies to avoid interference between different wireless systems.